Dublin, Ireland: March 20 2018 – eXpd8 Limited is proud to announce that its pure cloud legal case management software, Thread Legal, has been approved and accepted by Microsoft for inclusion in the App Source. This expands the global reach for this disruptive and innovative application. Thread is the only product built with Microsoft and listed in their Professional Services category. Thread is the missing piece of Microsoft Office 365 for lawyers. It is a new innovative solution that includes legal case management, time and expense management, document management, scanning, billing and lots more. 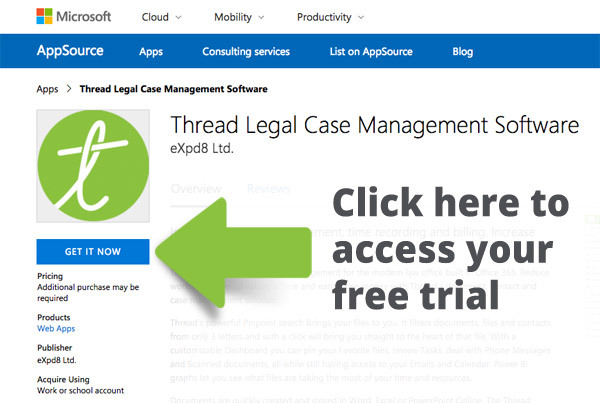 Thread Legal’s presence in the App Source means it is now so easy for lawyers or professional services firms using Office 365, to get a free trial in minutes. “Our relationship with Microsoft is key”, says Declan Brannagan, Chairman and Founder of eXpd8 Ltd. “From the initial meeting with their architects to collaborating with their Co-Sell team, we have been supported and inspired at every turn. Being listed in the App Source is a milestone and further validation that what we’re doing is recognised and welcomed by Microsoft and the legal community”, continues Declan. “Microsoft’s reputation is a major factor in digital transformation decisions for law firms today. As the industry leaders in security and compliance, Microsoft show what’s possible and how their solutions, including Thread, can add value and reduce waste” says Liam Mullaney, CEO eXpd8 Ltd.